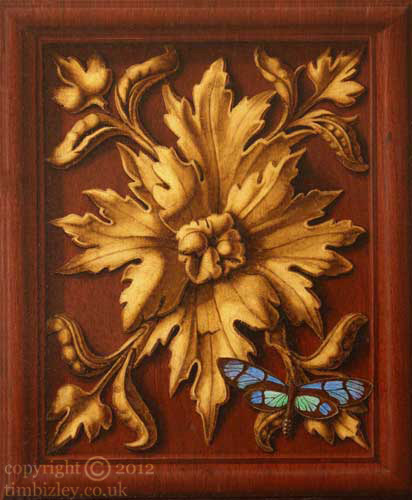 A butterfly alights on the gilded ornament of a mahogany panel. This trompe loeil painting is something of a vanitas the butterfly representing the ephemeral nature of life. Symbolic elements alluding to the vanity of life have been popular in illusionistic and trompe-l'oeil art since the 17th century. Sometimes these forms are incorporated into the illusionistic art of mural paintings, along with ludic elements which have historically and thematically been long associated with the form.